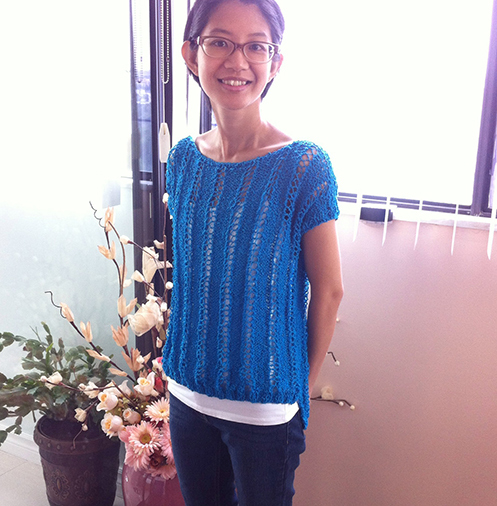 Recently finished this summery top :D The Yamamichi‐mon tee on Ravelry. I used a vintage yarn that I inherited called Bouquet Cindy Cotton Look. I thought the texture of the yarn would work well with the design of the sweater. It’s worsted/light worsted weight, and I used 7mm needles. So to compensate for the much larger needle and heavier yarn, I cast on 76, then when dividing for the shoulders and the neck, I bound off 36 stitches in the centre/neckline, leaving 19 stitches for each shoulder. I knitted only 4 short rows to shape the shoulders on both front and back, and after binding off the stitches in the centre/neckline, I bound off all of the stitches in the shoulders in the next row. The front piece measures 19″ and the back pieces measures 21″. The finished sweater measures 40″ around. Hope everyone has a lovely, sunshiny week! Yes! That’s a great color on you! Sweater looks comfy, too! What a nice top for summer! I like the lightness of the top.